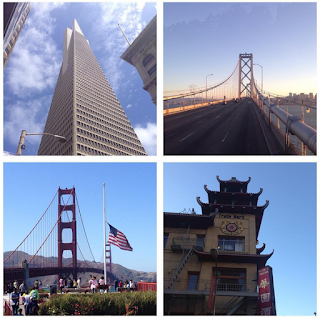 Back in July the Rewards Canada family took a vacation to San Francisco. This was quite a last minute decision on our part, it was late July and we really wanted to get away before our busy August. It was Sunday night and could travel later that week. Without going into all the search details on places we haven't been and within a few hours of home seeing we only had 3 full days we decided on San Francisco. The Rewards Canada family had never set foot in San Francisco unless you include the airport for connecting! This was an ideal location seeing that we had done Los Angeles (three times) Palm Springs and San Diego in the previous 14 months or so. Yes this is the power of miles and points, many of those trips were funded in part with loyalty programs! Seeing that we only had three full days we wanted to ensure that we got to SFO in a short amount of time so it was decided that we would fly on WestJet's direct flights so we could use up some our WestJet dollars. As we were redeeming WestJet Dollars from multiple accounts I actually had to call in to WestJet to book the flights as you cannot redeem from multiple accounts online at the same time. The process was really simple as I just had to supply our WestJet Rewards numbers and told the agent we wanted to use our dollars for the flights. The cash portion was put on my Diners Club Club Rewards MasterCard so we could also utilize Club Rewards points for a portion of the costs to make what would be an expensive flight purchase more reasonable. What initially began with flights costing $3,014.36 ended up only costing us $1,824.36. A great example of 'flexible' reward programs like WestJet Rewards and Diners Club Club Rewards. You don't have to wait until you have the full amount of points or miles. WestJet does require a balance of $25 to redeem if you don't hold one of their RBC MasterCards and that is why you only see three WestJet redemptions for the four of us travelling as my older daughter only had $24 in her account at the time of booking. You can also see however that we earned WestJet Dollars on the cash portion of the tickets which explains why my youngest daughter actually earned more on her flights than my wife or I as she redeemed less dollars. Also you may see that our Diners Club redemption was actually done nearly two months after the trip. Again another bonus of flexible credit card programs, you can continue to earn points on purchases and use them towards a past purchase. Depending on the card you carry you have anywhere from 90 days to 12 months after the charge is posted to use your points or miles! Could we have utilized another reward program? Well I looked at using Aeroplan miles and all options required a connection with a lot longer travel time than the direct WestJet flights. With only 3 full days in San Francisco and this being a vacation, not business, we wanted to ensure we had the most time possible in SFO so the decision was made to go with the direct flights and enjoy more time in the Golden Gate city on the actual travel days.